Many government and agencies see India’s 1960s Green Revolution as a great success that Africa should emulate. The soaring suicide rate amongst India’s farmers tells a different story. Africa must learn the lessons from India’s controversial Green Revolution. Photograph by Rajarshi Mitra. The development community has been crowing of late about the obvious need to revamp African agricultural practices. Not since colonial times has it been so easy to blame small peasant farmers for the continent’s development woes. The standard agricultural development formula to address this, developed in other world regions, is to adopt new technologies and commercialise the farming sector. But African leaders ought to look twice before blindly encouraging their farmers to adopt this capital intensive approach. The results have been nothing less than deadly in central India. After four consecutive years of low rainfall, the Marathwada region of Maharashtra State has emerged as India’s farmer suicide capital. Located in central India, this region is about the size of Sierra Leone and has a population similar to that of Mali or Burkina Faso. Not unlike the savannah regions of West Africa, farmers in this relatively poor area used to mainly grow drought tolerant sorghum and millet, as well as other food crops. However, the Green Revolution of the 1960s – an international effort to boost crop productivity with the use of hybrid seeds, fertilisers and pesticides – encouraged farmers in this area to move away from growing a variety of food crops towards the production of cash crops, mainly cotton and soybeans. The underlying problem driving the majority of farmer suicides in this region has been indebtedness. Farmers borrow money to put a crop in the ground and then low global prices, insect infestations, or poor rains lead to low returns. Increasingly, indebted farmers then turn to more informal sources (often village money lenders) for further loans at even higher rates. Sadly, this vicious cycle often leads to the male head of household committing suicide to avoid the humiliation of total destitution, typically leaving behind an even more impoverished wife and children. So far this year, 660 farmers in the Marathwada region have committed suicide. This is up from 422 suicides for the same area during all of last year. Not counting this most recent year, nearly 300,000 farmers committed suicide in India between 1995 and 2014. Unlike other regions of the world where urbanites take their own lives at higher rates than rural folk, the suicide rate for farmers in India is nearly 50% higher than that of the general population. Suicides are also most concentrated amongst those farmers who grow cash crops (as opposed to those who grow food crops for their own consumption). One bright spot is that crop failures in India rarely lead to hunger because of the state’s extensive public distribution system which guarantees access to basic food stuffs at affordable prices for the poor. But that said, the farmer suicide situation is alarming and there is a collective clamour for the authorities to do something. The prevailing view, often expressed in the local Indian media, is that the system of chemical intensive, cash crop based agriculture is fundamentally sound and that marginal changes will make it function properly. These adjustments include more robust crop insurance, access to credit at reasonable rates, water at affordable prices, and inexpensive seed and chemical inputs. But is the Green Revolution approach to agriculture really viable in this part of India and what can Africans learn from the current crisis? 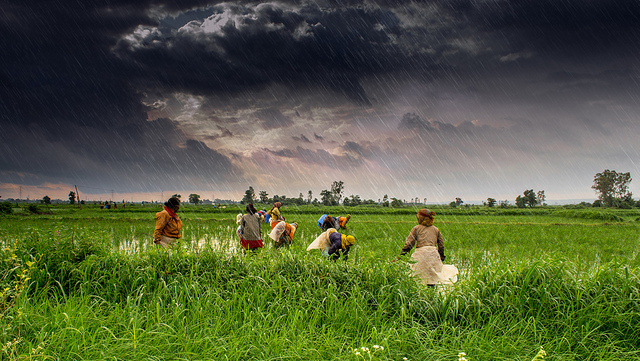 While this year is admittedly worse than usual, with the monsoon rains only 50% of normal, many Indian farmers struggle in even the best of times. Several decades of cotton farming in Marathwada has led to soil degradation, declining crop yields and the need to use even more chemical fertilisers. Furthermore, the idea of promoting more irrigation is not really practical as many cities in the region are already forced to ration water in drier years. Funnelling more water towards agriculture would likely further deplete groundwater resources. There are new voices in India now calling for an alternative approach to agriculture. Some NGOs are working through farmer field schools to introduce new agroecological techniques. These include plant associations in diverse cropping systems to maintain soil fertility and manage pest problems, the use of earthworms to produce rich compost, the planting of less thirsty crops, and new water-harvesting techniques and conservation methods. The saving grace of this alternative approach to agriculture is that it does not rely on costly external inputs, and therefore farmers do not take on the risky debt that has been driving the suicide problem. It is also more sustainable over the long run because it is less demanding of the soil and water resources. Given the shortcomings of the Green Revolution approach to agriculture in India’s Maharashtra state, it is not only the Indian government that must begin to rethink its approach to agriculture. We must question how Asia’s Green Revolution experience is being touted in Africa as the way forward. Organisations such as the Alliance for a Green Revolution in Africa (AGRA), the Gates Foundation, and the US Agency of International Development (USAID), argue that the first Green Revolution largely bypassed the African continent. The result, they suggest, has been a huge untapped agricultural potential and a persistent hunger problem on the African continent. Proponents of a New Green Revolution for Africa argue that the increasing use of improved seeds, fertilisers and pesticides, along with a more commercialised farming sector that involves agroprocessing, will increase farmer incomes and eliminate hunger. But aid agencies and African authorities should carefully study the experiences of India with the first Green Revolution before uncritically adopting this approach. While it may be appropriate for the region’s wealthier farmers, this more capital intensive strategy is often too risky and environmentally problematic for poorer cultivators. They must also understand that India’s laws insuring affordable access to food have done more to combat hunger than unsustainable farming technologies. William G. Moseley is a Professor of Geography and African Studies at Macalester College in Saint Paul, US. He is currently on sabbatical and travelling in India. Follow him on twitter at @WilliamGMoseley. William G. Moseley is a Professor of Geography, and Director of the Food, Agriculture and Society Program, at Macalester College in Saint Paul, MN USA. Follow him on twitter at @WilliamGMoseley. What will Brexit mean for Africa? Ironically, Borlaugâ€™s post-WWII ‘green revolution’ has actually served to turn much of the African continent brown. In Malawi, where I live, the green revolution’s focus on the chemical-based monocropping of hybrid seeds has meant that traditionally seasonal, diverse, and free agriculture has been transformed into an expensive attempt to produce of only a handful of introduced crops at one time of the year. Most of Malawians now farm maize (corn), and try to harvest all of their food for the entire year in one month (April). In a tropical country where seasonal crops can be harvested throughout the year, we are now leaving our fields to stand in an idle state of uselessness for 11 out of 12 months. When the rains come in December and people have planted maize, their annual reserves from the previous season generally run short and the current crop is not ready for harvesting…this is the time which has become known as our chronic ‘hungry season’. Right in the midst of the most agriculturally productive time of the entire year the â€˜green revolutionâ€™ has left many people starving instead of celebrating in an abundance of natural resources. This new â€˜green revolution,â€™ which is being promoted by the likes of the Gateâ€™s Foundation and AGRA (Alliance for a Green Revolution in Africa), is again being aimed at the intensification of monocropping, but this time through an emphasis on genetic engineering to adapt plants and animals to the problems that we, as humans, are creating. Malawiâ€™s over-emphasis on only eating maize has left us with a nutritional stunting rate of 47% for children under the age of 5â€”almost half the nation! This has nothing to do with the genetic make-up of maize, it is a reflection of the under-utilization of diversified and nutritious agricultural systems. A true â€˜green revolution,â€™ would serve to re-integrate many of Africaâ€™s well-adapted traditional resources into seasonal systems of naturally open-pollinated and perennial crops which provide year-round access to nutritional diversity. This is how we end malnutrition and food insecurity throughout the continent (and the world), not by genetically engineering one crop from Central America.